On Tuesday, 6-26-12 @ 12:05 PM Sir River passed over the Rainbow Bridge with dignity and courage. The last voice he heard was me whispering in his ear that I loved him and that he will always hold a special place in my heart. It was a very difficult decision to make, however in part he made it for me. His beautiful eyes told the me it was time to let him go. There will NEVER be another GSD like him---he was my protector, loyal companion, and I will always cherish the time we were together. Farrah (GSD housemate and Lady Scarlett (calico cat) know he is gone and they have been by my side ever since. It is quiet around here now, but I know River's spirit is with all of us. We had River privately cremated and he is not resting on the mantle watch over all of us once again. I RECENTLY LOST MY GSD ALSO. RESCUED HIM IN JAN 2008 AND HE WAS THE BEST AND MOST LOYAL FRIEND I EVER HAD. I KNOW HE IS WAITING AT THE RAINBOW BRIDGE FOR ME AND I AM SURE SIR RIVER MAXIM IS WAITING THERE FOR YOU. THANK YOU FOR SHARING SIR RIVER MAXIM WITH US! HE WAS A HANDSOME, & SPECIAL BOY! 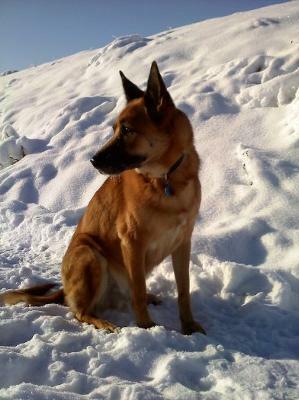 LAST OCTOBER, WE HAD TO HELP MY GERMAN SHEPHERD, PHOEBE ( 12 ) CROSS THE RAINBOW BRIDGE! HER SPIRIT IS ALWAYS WITH US, TOO! HUGS TO YOU AT THIS TIME! R. I. P. SIR RIVER MAXIM! I'm so sorry for your loss. RIP, River.